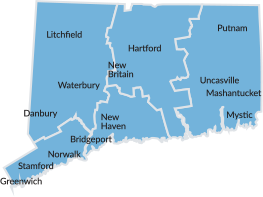 Connecticut is located at the heart of the Northeast region, halfway between New York City and Boston. And as the southernmost New England state, we are an easy drive from the larger Northeast cities. If you travel by car or bus, highways are easy and plentiful. Trains are primarily along the shoreline, with some service between New Haven and Hartford. There are also ferries from Long Island to our ports. And international airports in Hartford, New York and Boston make it easy to visit. Interstate 95 runs along Connecticut’s Long Island Sound shoreline, providing a direct link to all points in the state, whether you come from New York City, Boston, or Providence. Interstate 91 heads north from New Haven (I-95 interchange) through Hartford, connecting with I-90 (Mass. Turnpike) north of Springfield, Massachusetts. It continues north through New England to Canada. Interstate 84 enters Connecticut at Danbury (I-684 interchange) and runs northeast through Hartford to its link with I-90 at Sturbridge, Massachusetts. It also interchanges with I-91 at Hartford. The Merritt Parkway (Connecticut 15) links with New York State’s Hutchinson River Parkway at Greenwich; it becomes the Wilbur Cross Parkway near Bridgeport and links with I-91 at Meriden. Greyhound Bus Line, Peter Pan Bus Lines, DATTCO and Kelley Transit offer regularly scheduled interstate services for most points in Connecticut. GOGO Charter Bus Connecticut offers motor coach and charter bus services. CT Transit provides services to 26 towns in the Hartford and New Haven areas. CTfastrak is Connecticut's Bus Rapid Transportation. Southeast Area Transit provides daily service in the New London County area with 19 fixed service routes within nine towns. Estuary Transit District provides transportation for Chester, Clinton, Deep River, Essex, Killingworth, Lyme, Old Lyme, Old Saybrook, and Westbrook; with connections to New Haven, New London and Middletown areas. Bridgeport & Port Jefferson Steamboat Co. Year-round ferry operates daily. Departs from 330 Water Street Dock in Bridgeport. Chester/Hadlyme Ferry. Selden III, a ferry that crosses the Connecticut River near Gillette Castle State Park, carries 8 to 9 cars per trip. April-November, daily including holidays except Thanksgiving. Glastonbury/Rocky Hill Ferry. The Rocky Hill ferry has earned a place in history as the nation’s oldest continuously operating ferry service. The Hollister III, an open flatboat, is towed across the Connecticut River by the towboat Cumberland. May-October, daily including holidays. New London to Block Island, RI. 160-foot high-speed catamaran passenger ferry with air-conditioned cabins with outdoor seating. New London to Montauk, NY. Passenger ferry Viking Superstar carries foot passengers and bicycles to Montauk, NY.